The alleged gunman, Micah Alleyne, was arrested and charged with murder, reckless endangerment, and weapons charges, police said. NYPD officers at the West Indian Day Parade in 2015 after the shooting death of Carey Gabay, inset right. Sources say that Micah Alleyne, the man charged in the death of Gabay, is inset left. Police arrested a 24-year-old man in the shooting death of Carey Gabay, a lawyer and aide to Gov. 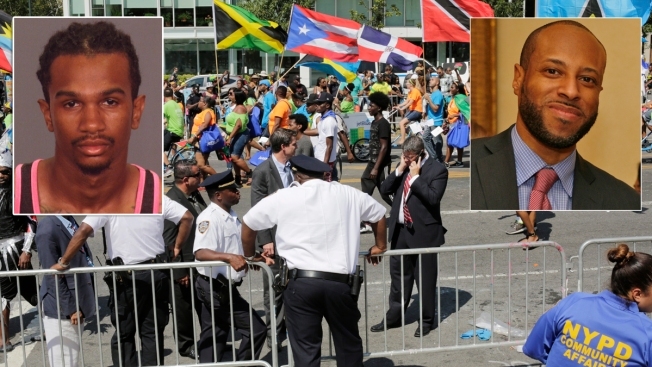 Cuomo slain hours before the 2015 West Indian Day Parade in Brooklyn. Alleyne's lawyer, Edward Friedman, declined to comment. Gabay, a first deputy general counsel at the Empire State Development Corporation, was caught in the crossfire between two gangs around 3:40 a.m. Sept. 7, near the parade route in Brooklyn as more than two dozen shots from up to three guns were fired, authorities have said. The shooting came during the J'Ouvert festival leading up to the parade. Court papers say Alleyne and "numerous others" fired guns and one of the bullets struck Gabay. "As I have said from the beginning, we are determined to get justice for Mr. Gabay and his family," Brooklyn District Attorney Kenneth Thompson said. "And we will continue to press forward until we hold everyone responsible for his death accountable." The 43-year-old Harvard-educated lawyer and Bronx native was shot in the head; he died after being hospitalized for more than a week while in a coma. Police have said Gabay was an unintended victim. "Carey Gabay was an exemplary public servant who lost his life in a senseless tragedy. Today's arrest is a major step forward in the pursuit of justice for Carey's family and loved ones," Cuomo said in a statement. The festival and the parade that follows attract hundreds of thousands of revelers to Brooklyn every Labor Day but have been marred by several shootings in recent years.